Yesterday while playing at the park with the kids, my 7 year old son approached me with a very inquisitive look on his face. I’ve never cried at the playground before. This morning at breakfast one of my children asked me what an “Amish Paradise” is. (For the uninitiated, you may click on the link to see the video.) When I was a teenager singing along to “I Lost On Jeopardy”, did I have any idea that I would be hearing my own small children sing it? Not so much. So we start explaining to my son what it means to be Amish. When I mentioned that the women dressed very modestly and wore no makeup, he said, “Good“. I guess that’s why she’s a girl. 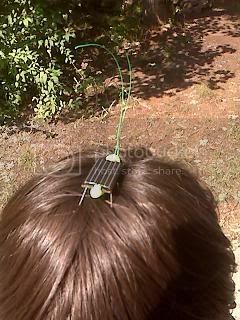 My 7 year old son Julien is really interested in solar energy. He is a constant source of questions. 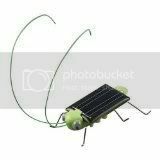 This last question was after spending one afternoon playing with a solar powered toy from Fat Brain Toys. They sent over this toy for us to test out and he had great fun with it. Fat Brain Toys has an awesome line up of high quality toys for kids that don’t play by themselves. You know the types. Plug them in and sit back and watch? I really don’t like toys that require batteries. Even though we use rechargables, those still wear out eventually and they’re also quite expensive. This toy took all of half a minute to assemble and once you place it in the sun, it hops around on the ground (or in your hair, if you’re so inclined!). Julien enjoyed this bug as you can see and still plays with it one month later. I think it helped keep those wheels turning in his head about alternative energy. He’s excited about the fact that the sun’s energy doesn’t “wear out” like other sources. You can check out Fat Brain Toys’ line up here. The following is the transcript of the interview with Donna Bateman of Parents With Purpose. You can also listen to the interview here. Carrie: My guest this week is Donna Bateman. Donna is a mom of 8 and if that wasn’t enough, a neurodevelopmental specialist. I can tell you have a lot of passion and you want to help parents and teach them what you’ve learned. Tell us what Parents with Purpose is all about. Donna: Parents with Purpose is all about empowering parents with information. It’s so often that we parent by accident. Something happens, and we say, “Wow! Something happened and I wonder what I should do about it?” We spend so much time reacting and responding instead of stimulating and guiding. We want to put parents back in the driver’s seat. Give them a road map – here’s point ABC and how to get there. Especially when it comes to an area that so many people think you can’t be in charge of and that’s the brain development of your children. Since the brain runs the whole show, that would be a great place to start. And so if someone has something that’s not going the way that it should, basically if someone isn’t academically successful, physically coordinated, and socially gracious…something is not working the way it should. And we can pinpoint through the integrative and developmental progression chart that whatever part of the brain is responsible for specific functions, and if something isn’t working well we can work to stimulate that particular area of the brain in an orderly way that we know the brain responds well to. And it’s amazing when you go to the root cause of problems of the symptoms of that problem just go away. C: I’m all into the root cause of things. I’m very much an advocate for figuring out the root cause and not just treating the symptoms. So hopefully if I keep rubbing her in that she’ll get the idea! I love getting to root causes. I love looking at the facts and every time I teach a class to parents, and I usually teach an 8 hour class where parents come and I go through the whole development of the brain. Every time I teach that class, [parents look at me and say, Wow! This wasn’t some complicated, difficult to understand thing, I can understand this, and by the way, it kind of makes sense. It is how people really do develop. It’s very common sense. And so once they can see it laid out clearly before them, the problem doesn’t seem so overwhelming anymore. They don’t have a label, but they do have a cause. A label would be something like Autism or Cerebral Palsy or ADD or Asperger’s Syndrome which is so commonly diagnosed these days. Any of those – I mean I know of over 300 labels for brain injury – but none of them are really talking about what’s specifically going on in the brain. When I talk with parents after I evaluated a child, if they ask me to do that, I might say “Well, your child has a mild/moderate/severe or profound injury to the…[part of the brain affected]“. It could either be extensive, over a lot of the areas of function, or a few of the areas of functions. It could be bilateral or unilateral. It affects one or two hemispheres. So I really want to talk about what is happening in the brain. Probably the biggest thing parents have trouble with is I can’t say something to them, and reasonably and reliably expect that it will happen. I can’t give them a 4 step request and know with pretty good accuracy that they’re going to get it. But you should be able to do that. By the time a child is 6 years old, they should be able to perform a 4 step request. So it’s exciting when parents believe that it can happen, that things can get better, because when you’re in a negative place, it’s kind of like “let my people go”. Wow, I can actually get to that positive place. Especially if you’re hearing negative messages from family members and teachers and neighbors, if you’re constantly being bombarded with negative messages about your child, I can’t think of a worse place to live. And you get defensive a little bit because that’s your precious child. And you probably already know that things aren’t going right, but you really don’t want someone… well you start t feel attacked. And so again, another negative vicious cycle. You feel attacked so you get defensive, so noone wants to say anything. So what’s happening is that child is not getting the help with an issue that we really can help with. I’m also reading a really great book right now called the Brain that Changes Itself. D: My poor husband is not getting a lot of sleep while I read! Because it’s just so exciting, and I have my computer also set on Google alerts, that it brings information that pops up on the internet and dumps it into my email. It is so exciting to me as I’m reading about all this research because honestly Carrie, not one thing I’ve read says that I’m wrong. Everything I’m reading says yes, we can change the brain. And the only thing that we’re doing wrong in these efforts to change the brain and make it sronger and better is that we aren’t doing enough. The brain it capable of so much more than we have been giving it credit for. I wanted to tell you one story about a little boy that I evaluated and I am going to use his first name because I already talked to his mom and she said I could. Little Timothy was ten months old when I bumped into his mother on an internet chat group. He had gotten a vaccination and started screaming 24 hours a day. He lost all of his mobility and all of his language except for the screaming. She was a very young mother in her early 20’s and this is her first child and she was beside herself. The Doctor kept saying, “Oh you’ve just spoiled him, you just need to let him cry.” Noone was giving her any good answers. I bumped into her on the internet and immediately emailed her, started having her do some detox because I knew he’s gotten this vaccination. Having her do some very very gentle detoxification with clay baths, and within a day he quit screaming. So she took my class and asked me to evaluate Timothy. 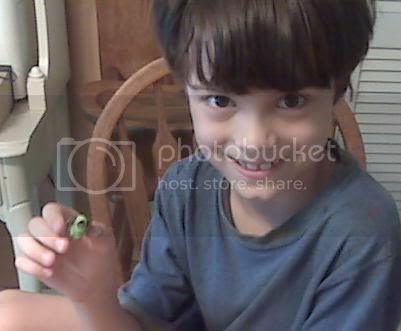 We did, and little bit I know that she had had early childhood intervention evaluate him the day before my evaluation. I evaluated that little Timothy was six months behind in language. Even though he was a ten month old, he had a language ability of a 4 month old. And he was behind in almost all of his abilities. I wrote a program specific stimulation for the brain. What I learned about Timothy was that he couldn’t process sound properly. I blasted an air horn at this sweet little boy and he didn’t even blink. And a ten month old should come completely unsown, they should be crying and climbing up on mommy, they should be unhappy. That’s a save your life skill of a threatening sound makes me pay attention and be fearful for my life. So she went to work on this program that I wrote for her to do in her home with her son. Her early childhood folks had said he needs speech therapy and our first appointment is in 3 weeks and we’ll come to your home. They showed up 3 weeks later, they had been doing my program for those 3 weeks and he had gained those 6 months worth of language in those 3 weeks and his services were terminated on that first visit. They did do a follow up just to make sure, which I probably think is a good idea. They did a follow up about 6 months ago before his 2nd birthday, and she had remained on the program I asked her to do and I had updated it because he needed different things. 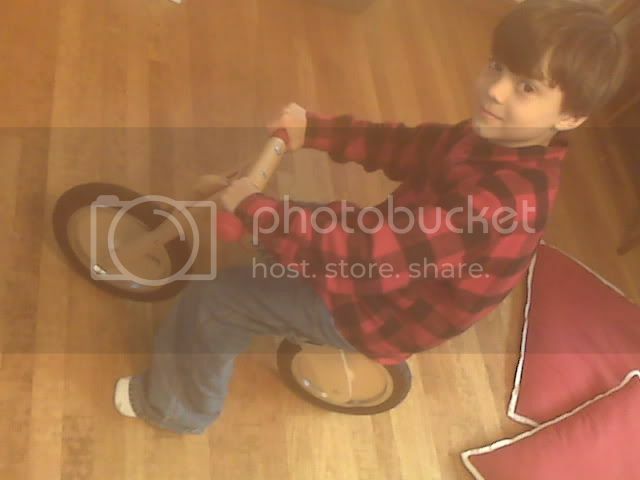 He was evaluated right before his second birthday by someone else, as being almost a 4 year old in skills. This is a very good mother, a very diligent mother, but she’s very young and doesn’t have a ton of training. She doesn’t live in a big city, she lives in a small town. It’s not like there’s a plethora of stuff available for her. It’s just really simple things that are important to the brain. It’s the way ababies are supposd to develop. D: You now, actually I’m kind of not. C: Something told me that, reading through your website, the articles… I definitely got that. D: I’m actually kind of not. And would I say that Baby Einstein is probably better than Teletubbies? Yeah, I would probably say that. But there’s a couple of problems I have with any kind of DVDs in particular. One is the repetitive nature of them. Those repetitive over and over again – what does that sound like? It sounds like some negative autistic behaviors. Another one is the fact that they are probably - little babies if they are watching those DVDs - they are probably in a physical position that I don’t think is good for them. They’re strapped in a chair or an exersaucer or sling or some kind of device that sits them up. C: Let’s talk about that for a second. I noticed on your site that you talk about the importance of physical activity. Something that interested me in recent years is the research around exercise being an effective antidepressant. You mention that and talk about the importance of children getting lots of physical activity. Does it matter what kind of physical activity or are you talking about a specific type of exercise? D: What I’m talking about what would be appropriate for their stage of development. 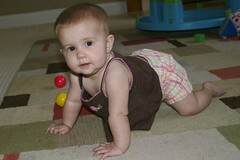 I think infants should be sleeping on their stomach, because infants are born to move. They’re created to move. When you’re pregnant, if a baby’s not moving, it’s very alarming. We rush off to the doctor and they whip out all the big equipment, everybody’s rushing around. But the minute that baby’s born, the first thing they do is wrap them up tight so they can’t move. And I’m just thinking, wait a minute. And hour ago, inside of me that would have been a problem, why is it ok now? Then they put them on their back. Well, how much movement are we going to get then? A problem with head shape. C: Or we’re getting a kind of a scary jerky movement. Babies don’t really like that unsettling feeling of being on their backs. D: And what we’re teaching them is, when they are on their backs and they move their arms and legs, they don’t go anywhere. So we are sending them very bad messages about what your arms and legs are supposed to do. When you put a tiny baby on their tummy, in the crib, down at one end of the crib, and you go back later when naptime is over, most likely you find baby head up against the other end of the crib, right? They’re just boring a hole in the crib to keep going. In their sleep, they are moving and that crawling, which the medical definition of crawling is on the belly like a commando soldier under the barbed wire. That belly crawling is the organizational duty of an area close to the brain stem. That’s also the area where we develop tracking, our eyes moving smoothly from left to right, which is a super important skill in reading. The more they crawl on their bellies, the more they move, truly for transportation, getting somewhere… the more that organizes that and catapults that up to the next level which is up on to their hands and knees. To the next level, on hands and knees, we call creeping, and that organizes the mid brain. They creep and motor al over the house they destroy everything room 18 inches down in the house, and they’re learning. They’re putting a ton of input. They’re developing their depth perception, because now they’ve got to be able to see from their shoulder to the floor. That’s the ability to perceive depth. And they creep and motor all around the house and a whole lot of good creeping really develops mid brain and catapults them up into the cortex which is where we start walking. C: Let me ask you, Donna. I was having a discussion with someone and we were talking about how especially in the States, parents seem to be a little overly concerned about safety and cleanliness issues. A lot of people don’t want their babies and toddlers crawling around on the floor, because they’re so worried about them putting things in their mouths etc., when that’s the way they learn… what are your thoughts on that? A parent who may be worried about that issue. D: We are hyper sterile. Try finding any soap in the world that isn’t antibacterial. Do we want to kill every bacteria? No, a lot of it is good for us. My husband’s a Scoutmaster so you can imagine that with 5 sons, 3 daughters and a Scoutmaster husband, cleanliness has never been able to be at the top of my list. So, we have to kind of let kids be kids. When I was growing up, we ran around all day outside. If you needed a drink, it came out of a water hose. We learned about tadpoles splashing around in a creek, not by sitting in a desk drawing a picture labeling all the parts of the life cycle of a frog. And yet we wonder then why our kids kind of don’t get the ideas that we already knew. I grew up spending some time on my Grandmother’s place and she had cows. I recently – and I live in a metropolitan area – and I did this little experiment with my own children. We were pushing this cart apparatus through a pasture. And my kids were petrified. “You actually touch it! ?” You do! It was actually a funny thing. So I robbed them a little bit of having that experience. And believe me, they understood about cows before I let them out o that pasture. But we rob our children of experience. We do have to be careful certainly I am not happy to see a baby with marbles in his mouth. That’s not safe. But a baby who has dumped out all the Tupperware in my cabinet and is chewing on al the lids, well, they’re gonna figure out. They’re learning, they’re experiencing. And it’s not a lot of fun to have to clean up all the dirt from the plant that has been dumped over, and derooted. And they now know more about the plant than I wish my carpet knew, but you just vacuum it up and move on. We joke in our house that no boy is considered a real boy unless he’s broken a window. C: Well in my house it’s my daughter that’s the real boy because she’s broken a window! She throws like a girl, for sure. D: I love a girl who can bust a window! Every boy in our house can now replace windows. We can’t rob them of those experiences. Things do happen. Accidents do happen but they are so very rare and uncommon. Unfortunately, by trying to protect them what we are really doing is shackling them. By not letting them experiment, by not letting them move around on the floor. It is a statistical reality that if you keep a baby on their back and never let them move until they walk, you have about a 5 time increased risk of them needing Ritalin, according to the mainstream world. It is a prescription for learning disabilities. C: Let me ask you this question Donna. Is there anything that can be done with a child who never crawled? That’s the way that it was with my oldest. He’s ten years old and certainly not struggling with reading, he’s an avid reader, bookworm, and he reads better than a lot of high school students I know, but he never crawled. That’s always concerned me a little bit. I would try to give him tummy time and he just hated it! He would just scream his head off. It always concerned me that he pretty much immediately went to walking. He went to holding on to furniture and scooting around. Is there anything I can look for? If you believe that you have a healthy child what are some things you can look for that might be areas of concern? D: Is there anything you can do for kiddos who didn’t crawl? Absolutely. You can go back to the future. We can get them right back down and get them creeping and crawling all over again. My children are doing it, and you have to get creative and make it fun. And it doesn’t need to be a negative thing, it can be lots of fun. My kids enjoy it. I read novels to them while they’re going around in a loop. They know how many “laps” they need to get done, and we do that, because we need it. D: I thought, wow – I hadn’t though of the broad concept of every book. So that’s great, but I wonder what his depth perception is like. How is his running? Running is a beautiful thing. I think one of the reasons we like to watch the Olympics so much is those runners who can really run well, it’s just beautiful. It’s so graceful and smooth. Not everyone looks like Michael Johnson, because he obviously gets it. But the form should be the same. It should be smooth, graceful, their arms should be up and pumping in a cross pattern, and their posture should be nice. We shouldn’t be hunched over, have our heads down. 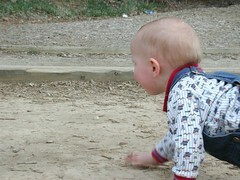 Some children who don’t get the crawling – when they’re running I see their arms drop down or flail out to the sides, and their running might not be super coordinated. Their depth perception can be certainly an issue. They don’t just go ripping up and down a brand new set of stairs, they might be a little more cautious. Where depth perception is really told is if you try to hit a baseball. When you’re up at bat you strike out a lot – I question how well your two eyes work together. Because both eyes, the triangulation of vision – both eyes bring a picture into the brain and overlap it perfectly, so that they have the picture with some depth. Unless they’re not working together perfectly and then that image is a little bit distorted so that hitting – for a ten year old hitting a 70 mile an hour fast ball coming at him – should be something he can do. If we’re struggling with that, let’s look at perhaps why. Some issues with depth perception and coordination would be a real question for me for a child that didn’t creep and crawl. Another question would be, how are they with sound? Are they comfortable in noisy environments? C: That’s interesting. He seems to enjoy being the noisy person but has no tolerance for other people’s noise. D: Right. Well, that is something I do see a lot of. Of course they’re comfortable with sound, they’re the loudest person in the house! But your own sound is like white noise. In fact some children who are really loud are creating all that noise because they can’t deal with the other noise. D: When they’re not comfortable with sound, when they don’t locate sound well – and this is a skill that a lot of parents are not aware that is so important. By the time a child is 8 months old, they should be able to locate a sound just by the sound without visually seeing the sound. So that – in fact it’s a kind of a funny thing that happens. You’re sitting there nursing the baby and Dad comes home from work. And he comes through the front door, baby hears that front door and they instantly turn that head – to see Dad coming in. Unfortunately they don’t let go of the breast! C: Or they do and you spray everywhere! D: I go for spray rather than blood! But they instantly hear that sound and turn that head and they know exactly where it’s coming from. That’s really important for a lot of reasons. We rely on the location of sound a great deal for the meaning of that sound. I see people – there will be some sound – and they’ll say, what’s that sound? Where is that? Where is that? And when they say what’s that sound, they’re looking all around. They’re not just sitting there trying to figure out… well, it might sound like this or that. No, they’re looking. C: They’re trying to figure out where it is, not just what it is. D: Because once they see where it is, sometimes you can’t even see the sound. Like when somebody’s cell phone is going out of battery and stuck under the sofa cushion? What is that beeping? And you look around and you see where the beeping is coming from and you realize it’s under the sofa cushion and you know oh it’s got to be a cell phone. You didn’t see it but you know by where it’s located that it’s gotta be the cell phone because the remote doesn’t beep like that. So we rely on the location of sound a great deal for what that sound means. Children who can’t locate sound well misinterpret information a lot. C: What does that look like, misinterpreting information? D: Children who appear to be defiant. Some children will be really honest about it and they will just be confused. Children who struggle academically a great deal. A great deal of children who struggle academically can’t locate sound. Sometimes I come home after I do a number of evaluations I have my children locate sounds for me so that I know there is a child alive who can locate sound. Because I see it so commonly in 100% of the children I’ve evaluated, there are issues with locating sound. C: How does a parent know that’s what’s happening? D: You can play a little game with them. Slip a little blindfold on or ask them to close their yes or cover their face and you have a bunch of different sounds. You make the sounds from over, under, beside, in front, behind, make sound all around and make a variety of sounds – high pitched, low pitched, and then say point to where that sound is coming from. And you want it precisely. You want one pointer finger goes out and they can touch it. You don’t want them waving their arm around saying, “Well it’s somewhere over there”. That tells you that maybe we have the general idea but not exactly where it is. And you should know right exactly where something’s coming form. And you should know that by the time you’re 8 months old. So you can imagine in an 8 year old how confused they are when they don’t have that information to work with that an 8 month old should have. I evaluated one little boy who could not locate any sound in front of him. I’d be jingling a little bell or banging a block or making different noises in front of him and he would point over his head or behind him or down to the floor. Can you imagine the struggle for that young man in a classroom? A this negativity towards little Billy when he just can’t locate sound. And we can set up a program for him where his brain could learn to do that. There’s a very well known – there are lots of auditory programs and some of them are highly successful and I do sometimes use those kind of technological programs eventually, but our beginning programs with locating sound, laying the foundation for being able to do that, those are all simple things that can be done right in the home with objects from around the house. It is not expensive. Unfortunately some of the technological programs cost – I know one program that just one round, 8 – 12 weeks of it, costs over $3,000. Really effective but very expensive. We can lay a foundation for that with very little cost. C: So if a parent is listening and they’re not located in Texas where you are, are you able to work with a parent – can they avail themselves of your services remotely? D: Absolutely. I travel. I will be spending 12 days in California in San Jose and in Long Beach teaching and evaluating children there. Some parents like to put together a group of concerned parents. I know I had a group in the Colorado Springs area that called me up and said we had 5 families who want you to come. We’re going to pay – those families split my travel expenses and I came and spent over a week there and worked with those 5 families and then I came home. Then some families come into Dallas and that’s always an option also. It’s usually a lot less to fly me, one person, than to fly the family. And I like being able to go to people’s homes. One little girl that I saw – I was so glad that I went into her home because she really needed a program very very much and I was able to give her parents some things that she needed. But I said the number one most important program for your daughter is an honor and respect program for her two big brothers. C: Ah, I think I need a little bit of that around here! D: And we all do. We need a little honor and respect in my house very once in awhile. But they needed that. This family needed a little bit of re-centering. By them bringing me to their home I was able to see that. If I had some big clinical office that they just walked into, I would have never known that was the case. So because I was able to help sort of re-center this family in that way. Because when you have a child with challenges, it can really warble off center the whole family. Then we start coping, we start kind of defaulting to convenience foods, to videos as baby sitters, to letting children argue with us, letting children do things that we shouldn’t do because we’ve got this extra challenge here we don’t think we can really deal with all of it. When in reality if we can reorganize the whole family then we can all deal with the challenge together. And that’s something that’s really important to me. I don’t usually write a program for a child, I write a program for a family. I’m there to strengthen the family and help them pull together and work together. When I write a program for one child in a family to creep and crawl, I recommend that we all join in the parade. What, our brains are gonna be too organized? I don’t think so. It’s good for the whole family to work together. So families can bring me out, I like to visit their homes and see the flow. You get to know a friend, the first time you go to their home you know so much more abut them then you ever knew just chatting together at the library. So I like to do that, and families have that option or they have the option of coming to Dallas too. However it works best for them, I want to be flexible to work with them. C: That’s awesome to hear – that you’d be wiling to travel. Let’s end on this last question. Tell us some things, some simple things, that parents can do every day to help their child’s brain development. That is a whale of a topic that we can spend days talking about. But number on, nutrition. Get rid of the junk food. If you can buy it in a drive through, please don’t eat it. And if you won’t eat it, please don’t feed it to your child. Some basic nutrition: please eat as close to nature as you can. An apple is better for you than apple sauce. C: Or an apple is better than apple juice. D: Oh apple juice is not necessary. Your child needs to drink water water water water water. Please – a good rule of thumb is take their body weight in pounds and have them drink half that number in ounces. So if they weighed 50 pounds they would drink 25 ounces. Every day, of water and they would eat vegetables and protein and fruit and wholesome food. There are specific diets for specific children, but that one would be just a common sense – eat like Grandma tried to teach you to eat please. Number two, the floor as a way of life. Young children should be on the floor. They should be running, creeping and crawling all around – the floor as a way of life. Once they become vertical they’re up on their feet, walking and running and then a little more walking and then maybe some running – just mobility times ten. Another thing is that we do live in the United States and we do watch movies and we do watch DVDs and my children and I watch movies together and I’m not opposed 100% to television. But an interesting thing you can do with your children is set your DVD player to a foreign language. C: That’s fun, I’ve done that. D: If you want to see something hysterical, watch Toy Story in French. It is the funniest thing in the world, Buzz Lightyear trying to be all tough guy in French. If you expose your children to foreign language, you will literally grow a bigger brain for them in a significant way. Children all over the world are speaking multiple languages, we in the US are lazy about that. So that’s a simple thing. They learn English – by hearing us talk. So, if they only watched Winnie the Pooh in Spanish, guess what? They’re going to get a whole lot of Spanish. And they’re going to set those tones and phomenes that are unique to Spanish in an early and easier way. So set that DVD player to Spanish, and then get a little bit of better use out of it. Those would be to me, the best things that I would recommend. I would pay super close attention and trust your instincts if you know something’s wrong, don’t let somebody tell you that it’s not wrong. Every mother I talked to said “Oh I knew something was wrong way back when but I couldn’t get anybody to pay attention.” It happened to me with my youngest child and I’ve seen it happen. “Well if you really feel that way, wait and see.” What for what? Vesuvius to go off? Trust your instincts about that and don’t feel – when I tell parents all those things to do, just kind of the way mothers were back in Mayberry you know? C: Go outside and come in at dinner. D: They say I feel so mean when I do that. Please don’t feel mean. C: Going outside is not a punishment. It is good to be a little more proactive. And I think honesty Carrie, I think that things are shifting back that way. I think people are getting – are starting to see, you know what? We got off track. And so I hope that a lot of mothers will start kind of just looking at how they’re doing things and saying, you know that doesn’t make sense with how people really are. How are people really? Babies ought to be moving all around. Babies have been eating dirt for centuries. Maybe that speck is not going to kill them. So those are the things I recommend. And really just wholesome things, and from reading your website it sounds like a lot of those things go on at your house. C: Well Donna thank you so much for joining us and I encourage our listeners to go to your site. And browse your articles and see what you have to offer. If they have a child that they feel is having some difficulties, and even if they don’t. D: If they feel like they just want to make sure they’re staying on track. Hard to know if you’re staying on track if you don’t know where the track is. I never charge anybody for a phone call. I’m always happy to talk with folks. The kinds of mothers who call me are the best people on the planet earth and why would I turn away a chance to talk with someone like that? Well thank you so much! I’ve now signed up on your blog and I enjoy following your crew as they go along. It’s a fun adventure to watch. It’s fun when you can appreciate the wonder of good development. C: Thank you again Donna. Fellow natural mama Tiffany Washko has just released her raw foods recipe book for kids! I just finished reading through the book and it’s wonderful. I can hardly wait to dig in to the recipes (I even submitted a few that appear in the book). This “un” cookbook will be very helpful for me especially since my youngest child is allergic to wheat. The raw pie crust is gluten free and I can hardly wait to try it along with a pie recipe. Of course, you don’t have to commit to a 100% raw diet in order to benefit. We ALL want to eat a percentage of our foods raw in order to have a healthy diet. In the summertime, eating more raw is cooler and saves money too. 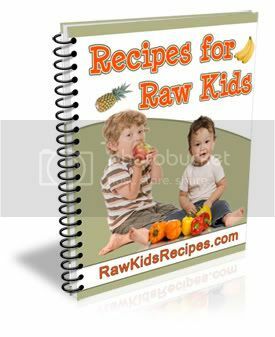 Not only does the book have 80 raw foods recipes that are kid friendly, it also has tips and resources for further information, and helpful products that will make eating more raw foods more convenient. Tiffany is a raw foods enthusiast and well known blogger for natural families. One of the more important principles of gentle discipline and attachment parenting are understanding a child’s developmental stages. How can you know how to discipline a child if you don’t know what you can reasonably to expect of them? For example, we don’t expect newborns to sleep through the night, and we don’t expect two year olds to sit still for long periods. It’s unreasonable of us to ask things of them that they’re unable to do. If you don’t get that your four year old may very well lie or “steal” and not truly understand why those actions are wrong, then you may overreact when your four year old takes gum from your purse repeatedly. And then denies it. No, she’s not going to grow up to be a kleptomaniac. That’s why I love the “Your _ Year Old” series of books by Louise Bates Ames, PhD. and Frances L. Ilg, M.D. They tell you what to expect from your kids during their various ages and stages. I grabbed three of these books from my shelves so you can see what I mean. I already mentioned an aspect of four year old development that is extremely common. Lying is very common among four year olds. They can’t really be expected to understand what a lie is at this age, even though they may be able to verbalize what a lie is (they’ve been told this by adults but can’t really understand such an abstract notion yet). Also common among four year olds is swearing. I remember when my second child start making up little cuss words at this age (he didn’t know any real cuss words and therefore didn’t have any in his vocabulary but he didn’t let that stop him!). I thought it was funny and knew not to overreact, but reading that this is normal for kids his age was a bit of a relief. Six year olds tend to be a bit oppositional. While five is often a peaceful age, things can change at six and a parent can find themselves with a child who suddenly defies them, screams or pitches fits. Six year olds frequently switch their numbers and letters. If your six year old does this, don’t assume they are dyslexic. It’s common at this age. Another interesting thing about six year olds is that they blame everything - good and bad - on mother. I was having a conversation with another mom about this very thing. It’s quite common for six year olds to become extremely upset, angry even, at mom when something goes wrong in their lives. I remember experiencing this with my son a year ago and sometimes it would hurt my feelings a little. Then when I read it was a common phenomenon among kids his age, I stopped worrying about it. That’s how these books can be so powerful. They allow you to separate your emotions from your parenting. The title alone gives you lots of information about common behavior among seven year olds. Compared to the drama of six, seven year olds often become rather withdrawn into themselves. Sevens also discover that “it’s not fair!” and believe that others have it in for them. Seven year olds often have more worries and fears than other ages. Seven year olds can be a bit perfectionistic, wearing themselves out trying to do this or that perfectly. Each of the “Your _ Year Old” books has the same qualifying statement, that it’s impossible to say what ALL kids are doing at any age, and that these are just a guide to common behaviors of the stage. These books introduced me to the concept of “equilibrium/disequilibrium” that I recognize in my kids. Things can go very smoothly for several months and then bam! you hardly recognize your child because a “good eater” is suddenly surviving on spit and air, or a “good sleeper” is suddenly refusing to go to bed, or an obedient child is suddenly defiant, etc. It’s not so much that your kids are trying to drive you crazy, they’re just in equilibrium or disequilibrium! Each of these volumes contains information on the tensional outlets common to the age, sleep and eating habits, how the child is likely to interact with parents, teachers and siblings, even how best to throw a party for each age. They even have toy and book recommendations that kids will enjoy at different stages. Each book is small and can be read in a sitting, but they have proven to be some of the best investments I’ve made in parenting books. I also like that the books recommend a very gentle discipline style. There are frequent references to Dr. Haim Ginott (another of his devotees are the authors of the How to Talk so Your Child Will Listen books). You can browse all the Your _ Year Old books on Amazon. There is one book for each year from 1 through 9, then the final one is 10 - 14. If you really want to understand both what your child is going through and how you can best help him, grab one for each of your kids ages. Yesterday’s pic was of my youngest daughter, Sadie, nursing her doll. I have several pictures of her like this but this one was one of the cutest. She looks like she’s enjoying herself. Last week I had a chance to use two products designed to encourage communication and closeness with your kids. The first was Mat Chats. One of the nicest things about eating together as a family is the time it gives you to focus on each other. You can talk about your day, discuss what’s happening in the world, tell jokes… whatever your family enjoys. Lisa Brown, the mom behind Mat Chats, decided to go a step further and invent a product to help her impart values to her kids, over dinner. As a widow and a psychiatric nurse, she knew the importance of active parenting. I can see how Mat Chats could even help take the focus off mealtime behavior issues and put it back where it needs to be: on connecting with our favorite people, in a way cultures all over the world love to do it: while eating a good meal. Mat Chats are large paper place mats based on several themes that give you thoughts and discussion provoking topics to discuss. The one we had was on Vision. It had a quote on the topic of vision, a definition, and 4 questions to ask and discuss. For example, “Name someone successful and discuss how s/he became successful.” “How do you define success?” etc. It was interesting to hear my children’s answer to these questions, and after using them for their designed purpose, they are quickly scarfed up for coloring on! You can learn more about Mat Chats on their website. The second tool were these really cute Kids Lunch Box Cards. These are for parents to slip into their kid’s lunch box - an easy and fun way for kids to feel connected to their parents while they’re away at school. I thought these were super cute, but my kids aren’t away from me at school. So I slapped a postcard stamp on the spot provided on the back and mailed them to each of my kids. You know how kids are always wanting to get their own stuff in the mail. They’re still trying to figure out who their Secret Friend is. The cards come in 5 themes: Wacky World, Fairies, Riddles, Gross-Outs and Looney Laws. My daughter of course got one of the Fairy cards, pictured above. It’s pink, after all. My 7 year old loved the card with a fun fact about Astronauts: apparently, they’re not allowed to eat beans post takeoff because farts can damage their suits. He’s fascinated with space travel. And farts. My oldest got a card with a gross fact: Cockroaches can survive for 9 days once beheaded. He, like most 10 year old males, is into gross facts. It was a real treat for them getting the cards in the mail, and I look forward to being able to send them meaningful little messages throughout the year, unexpectedly.